New 'Winter Warmth' sets to keep the dolls cozy during the snowy winter months! My 'Regency' section is sadly lacking in variety at the moment. I'm planning on at least 2 new 'Ball Gowns' and hopefully a new 'Spencer' jacket outfit soon. New Tudor designs!! I have found so much material and inspiration. I can't wait to get started! Yes, it's a lot. My main goal is to have the 'Winter 2012 Collection' released by Thanksgiving. It's a month early because of the Christmas shopping season! BUT, I want suggestions from YOU! What would you like to see as a new doll dress? What time periods would you like to see more variety in? Leave a comment here, or, send me an email! If you have a particular style in mind, please send me a picture! A historical painting would be best, but any picture will do! Who knows, you might just see your idea made into a doll dress! My email address is yoreclothes@ntelos.net. I'd love to talk with you about your ideas! 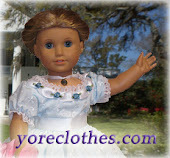 Every year 'Doll Clothes of Yore' packs up and heads to Salem, VA to be a vendor at 'Olde Salem Days', an annual town fair. The town of Salem shuts down Main Street and various other side streets, and vendor booths line downtown. Our booth is located about mid-way on Main Street close to the Salem Library. Olde Salem Days is this Saturday, September 8th. If you live in the area, or if you want to make a trip, come down! Over 60,000 people come to look and shop for unique Christmas gifts and other things! If you come down, look for the banner pictured above. It will be hoisted above our booth!